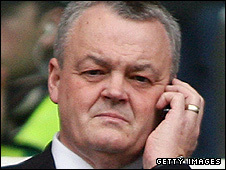 Bolton chairman Phil Gartside has called for a two-division Premier League to increase competition. Gartside, a member of the Football Association (FA) board, also wants better protection for British owners from foreign tycoons, and a salary cap. "It is time to look at two Premier Leagues - Premier League One and Premier League Two," said Gartside, who wants 18 clubs in each division. "It would even everything out and make it more competitive", he added. Gartside, one of longest-serving chairmen in the top flight, believes in addition to making the Premier League - which currently has 20 teams - more competitive, the changes would solve a number of other problems. "You could have 36 Premier League clubs split into 18 and 18 and that would also solve the problems of the winter break and supporting the England team," he said. "We have already got to the situation where the three clubs that go down from the Premier League are usually the three that come up, although a couple of others might sneak in. "I don't have the answers but it is certainly time for a debate - perhaps even on not having relegation from a second division of the Premier League." Gartside, who has been a director at Bolton for 20 years and chairman for nine, also feels that the Premier League clubs still under British control need protection from foreign investors. "The traditional type of owner are something of a dying breed, instead you have the Sheikh of wherever and people like the Glazers coming in," he said. "Local businessmen like (Bolton owner) Eddie Davies, the late Jack Walker (at Blackburn), Dave Whelan (Wigan) and Steve Gibson (Middlesbrough) have given their town teams unbelievable financial backing. "They need to be protected in some way from the influx of outside investors with seemingly unlimited funds." He added: "There is still talk about foreign takeovers of Newcastle, Everton and Liverpool, again, and once we have 14 foreign owners in the Premier League we have a problem. "At the moment we can still muster enough votes against anything that might change the structure for the worse. Come the day when you have 14 foreign owners we won't be able to do that." What do you make of Gartside's comments? Gartside had previously been opposed to the idea of wage-capping but now feels it could work in the Premier League. "I have been against wage-capping in the past but it has come to the point now where we have to look seriously at it," he said. "When Manchester City go out and spend £30m on a player and then pay him whatever he wants as a salary, then that raises the bar for us next time we go into the transfer market. "We have to look to see whether we can bring in a system of wage-capping, perhaps like they have in American football or Aussie rules."